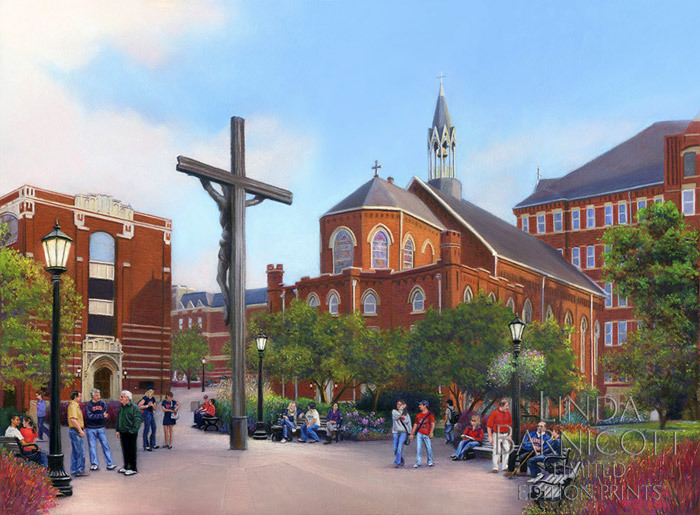 Linda’s painting, “Chapel on the Bluff”, features Duquesne University’s cherished chapel that overlooks Pittsburgh’s downtown area. Click below to purchase and hang this vibrant limited edition giclee print in your home today! Founded in 1963, Pittsburgh’s La Roche College is steeped in a rich history of preparing students to embark on the next stage of their life. 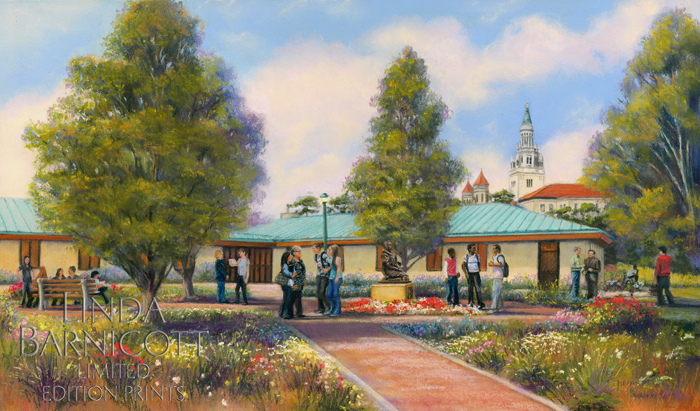 Linda’s painting, “New Beginnings at La Roche College”, honors this tradition and is now available for sale. 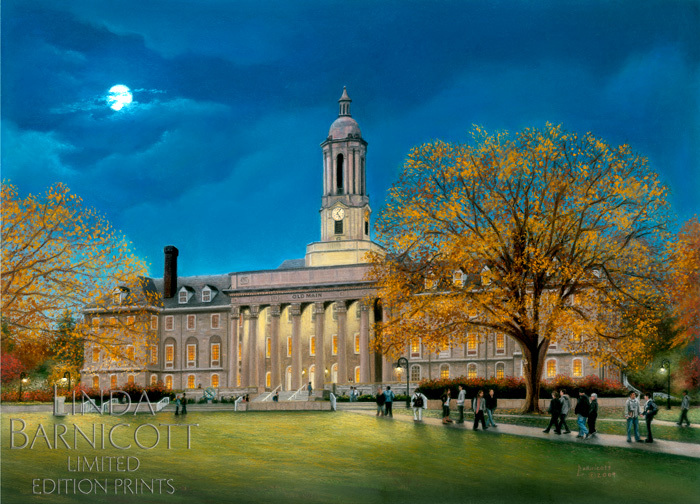 Linda’s rich and vibrant painting, Old Main “The Heart of the Lion” captures the jewel of Penn State University’s main campus. 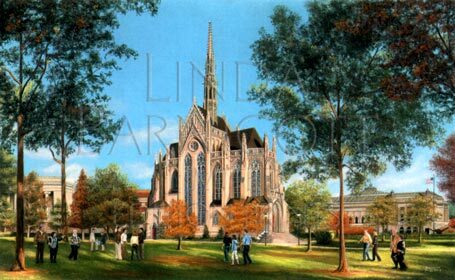 Click below to purchase this exquisite limited edition giclee print for your home or as a gift for a loved one who is one of the university’s alumni. 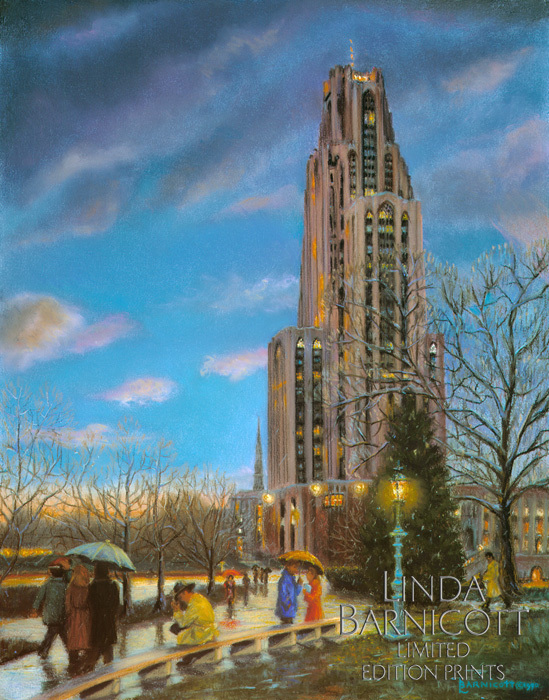 Linda celebrates “The Glory of Heinz Chapel” in her exquisitely painted composition featuring this memorable Pittsburgh landmark. Second in the series “Autumn in Oakland”, it makes a wonderful companion print to “Game Day at Pitt Stadium”. In her classic painting, “Walking in the Light of the Cathedral”, Linda welcomes you into a timeless setting where the sudden onset of a cool drizzly rain awakens memories of days gone by and dreams yet to come… so step into the glow and experience “Walking in the Light of the Cathedral”. As part of her “Pittsburgh Remembered” Series, this nostalgic painting is now available as as an archival giclée print.